National Democrats think they have a chance to unseat Michele Bachmann. Their growing sense of optimism comes after a cable TV interview where the 6th District Republican congresswoman used the word "anti-American" to refer to Barack Obama and called for an investigation into members of Congress. House Speaker Nancy Pelosi said today that Bachmann discredited herself. The Democratic Congressional Campaign Committee said it intends to spend more than $1 million in ads to defeat Bachmann. Democrats in Minnesota and on the national level are using Michele Bachmann's comments to raise money and to energize get out the vote efforts across the state. They have also made her seat a top target. 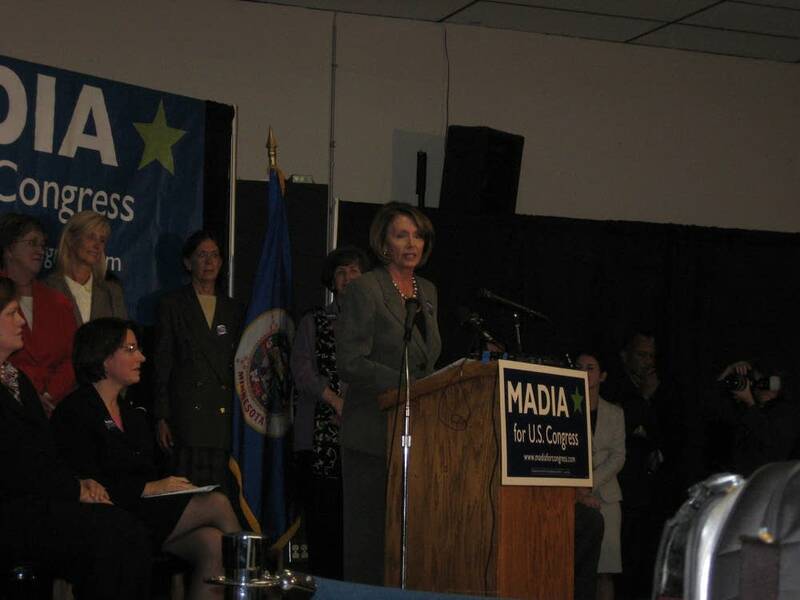 Democratic House Speaker Nancy Pelosi was asked about Bachmann during a trip to the Twin Cities to campaign for another Congressional candidate. "The Republicans are bankrupt in their ideas. They have no ideas about jobs and education and health care and eliminating our dependence on foreign oil," said Pelosi. "So what do they do? They question the patriotism of others. I think that a statement of the kind that Congressman Bachmann made dishonors the position she holds and discredits her as a person." At the same time Pelosi was talking to reporters, Bachmann was defending her statements during radio and TV appearances. She said on Fox 9 that her comments were misinterpreted. "So what I was telling Chris Matthews is that the media needs to look at Barack Obama and the media needs to look at members of Congress. He wanted to know whether I thought members of Congress were anti-American," said Bachmann. "And what I'm told him is that's not up for me to decide. The media should make that expose. That's not my call. My comments were completely misconstrued to say that I believe members of Congress are anti-American. I never said that"
"The news media should do a penetrating expose and take a look. I wish they would. I wish the American media would take a great look at the views of the people in Congress and find out are they pro-America or Anti-America. I think the American people would love to see an expose like that." Bachmann was unavailable to comment for this story. It's uncertain what she meant when she said "pro-America" or "anti-America." Bachmann's DFL challenger Elwyn Tinklenberg and The Democratic Congressional Campaign Committee have used Bachmann's comments to raise money. An official with the DCCC said the political committee intends to spend $1 million in TV ads targeting Bachmann. Tinklenberg said his campaign has collected more than $800,000 in donations since Friday, more than double what he had left in the bank on September 30th. Tinklenberg said he intends to use all of that money on TV and radio ads. He said Bachmann needs to explain how her comments help bring the country together. He said her comments smack of Joe McCarthy's investigation of alleged communist sympathizers in the 1950s. "To hear in that kind of a call echoes of the House UnAmerican Activities committee, and that's part of this sort of the visceral reaction to this. In that, people have recognized that we have gone too far," said Tinklenberg. Tinklenberg says voters within Minnesota's 6th District are just as unhappy as the many out-of-state contributors to his campaign. 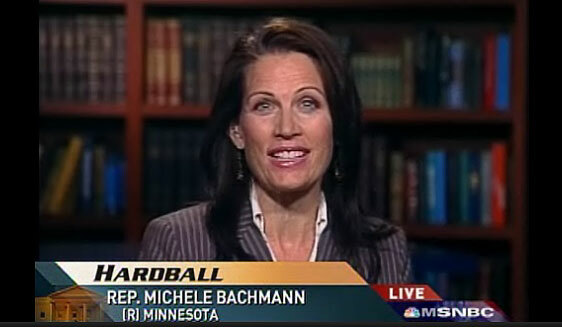 Even some Republicans are calling Bachmann's comments inappropriate, including Gov. Tim Pawlenty. But Gov. Pawlenty said candidates sometimes misspeak in the heat of a campaign. "If you do a lot of interviews, you're eventually going to say something that you wish you would have said something differently. It's just the nature of talking all day. Some words are going to come out of your mouth that you could have said better or should have said better, should have done differently," said Pawlenty. "We've all been there to varying degrees. I know I've been there." And outside analysts are reconsidering the 6th District race. David Wasserman with The Cook Political Report says Bachmann's comments could prompt independent voters and Republican moderates to consider Tinklenberg. 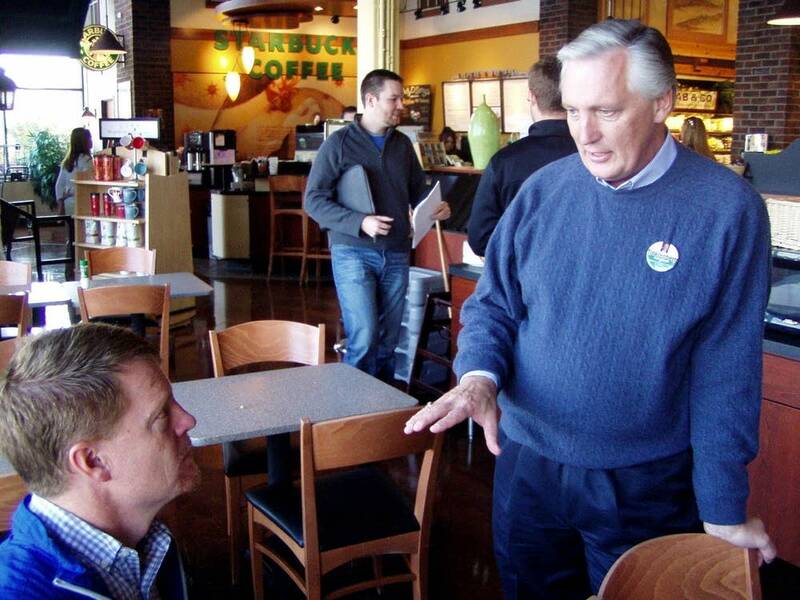 He moved his rating of the 6th District from "Likely Republican" to "toss-up." "Look, this is fodder for Democratic commercials regardless of how she reacts to it. She just made this race much more of a referendum on her. That is a welcome development for Democrats and Democratic ads are likely to be setting the tone and the agenda," said Wasserman. The District has a Republican edge. Bachmann defeated DFL candidate Patty Wetterling by 8 percentage points two years ago. George W. Bush defeated John Kerry in the district by 14 percentage points in 2004.